Named after the delicate Duchess of Rivoli, these vibrant birds are beautiful in full sun, with iridescent green and magenta red feathers. Originally from Southern California and Baja, Anna's can be found all the way north to Canada and as far east as Arizona. 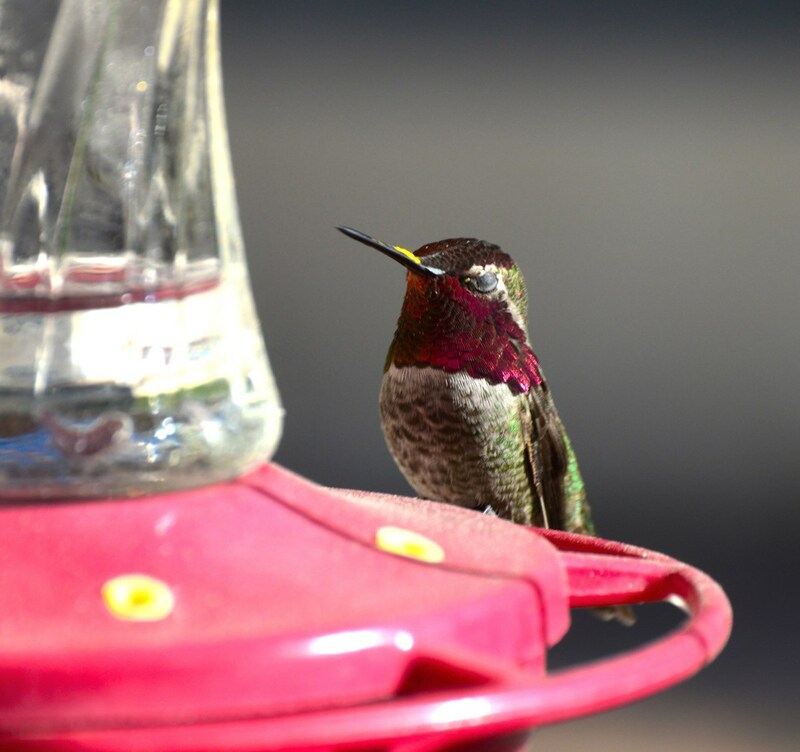 This guide contains Anna's hummingbird photos. 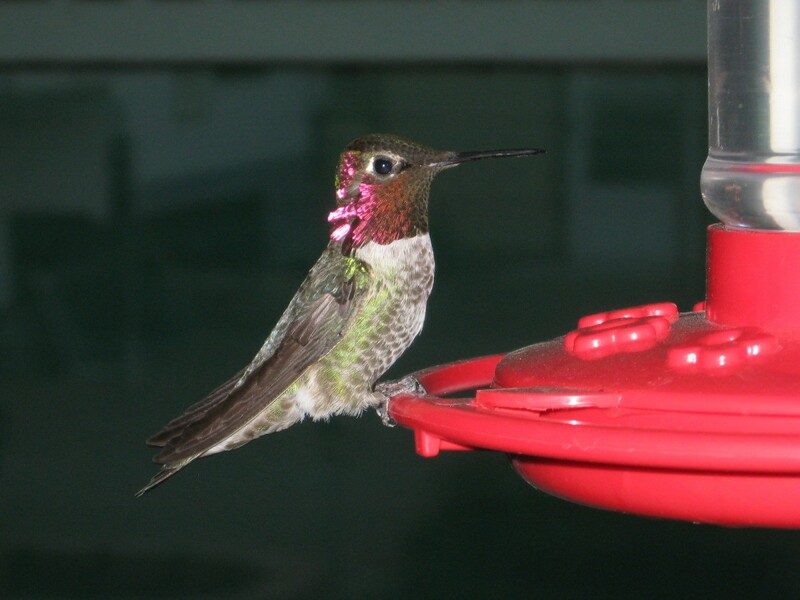 This is one of our favorite hummingbirds, Mr Red, because he's the friendliest little guy of all the hummingbirds, I've ever seen. Of course hummers love to guard their feeders, and this one wanted his cake and to eat it too by guarding the feeder but was too tired to stay awake. He's got yellow pollen all over his bill from all the flowers, and probably wanted a drink of nectar (sugar water) before he went on to pollinating the other flowers by seeking nectar from them, and he was just as content as a hummer could be, that he fell asleep for awhile at one of his favorite feeders before his job was done. I've only seen one other hummingbird over the many years I've fed them, take a nap. We had one little hummer we'd cared for overnight in our house (with the guidance of a licensed professional) and that little guy actually slept upside down (like a bat) all night long which really shocked us that they can, or do sleep like that. This picture was taken in our backyard in Las Vegas NV. 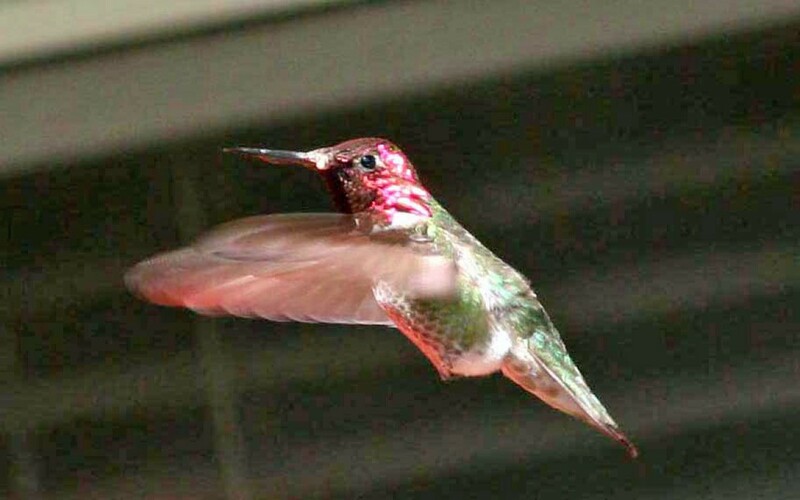 This lovely Anna's Hummingbird came in under the patio roof to feed on a lavender blossom. He stayed a brief time, hovering ever so carefully, to approach the lavender blossom. 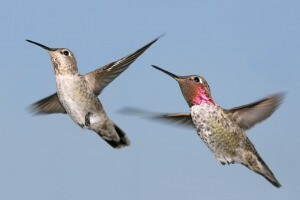 Lavender blossoms are very popular with hummingbirds. We call these two, the Bibs sisters, because they both have like a red bib on their necks, actually their throats, and it's adorable how they'll sit at a feeder together, and in this picture they'll even drink together from the same hanging feeder. They're female Anna's. We get the biggest kick seeing them on the wire that holds their feeder here, especially when one gets in a funny position, like this female hummingbird on top, she's up too high on the wire, but she's found a way being almost upside down to share with her sister, hehe. This picture was taken in our backyard in Las Vegas. 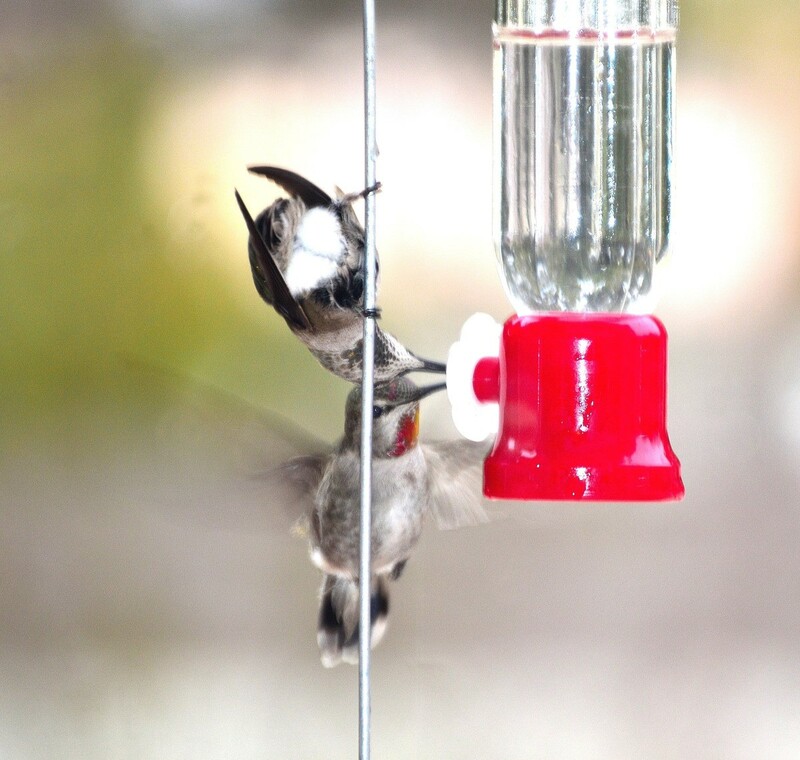 This macro photo of the hummingbird shows him hanging in the air looking for the bird feeder. The hummingbirds are prevalent now with many coming to feeders and Mexican sage blossoms and geraniums. We call him Mr. Red and he's the most curious hummingbird I've ever seen. He follows me when I'm outside filling each of the feeders, and he's curious as can be, and, as sweet as can be. He never minds me with the camera either. When I fill the lower feeder, where I'm hunched down by the fountain, he's right there with me too by my head, and I can feel the wind from his wings. Snow in Las Vegas is so rare. It's fun watching the hummingbirds have so much fun in it. They've never seen or been in it before, so it's quite a treat for them. 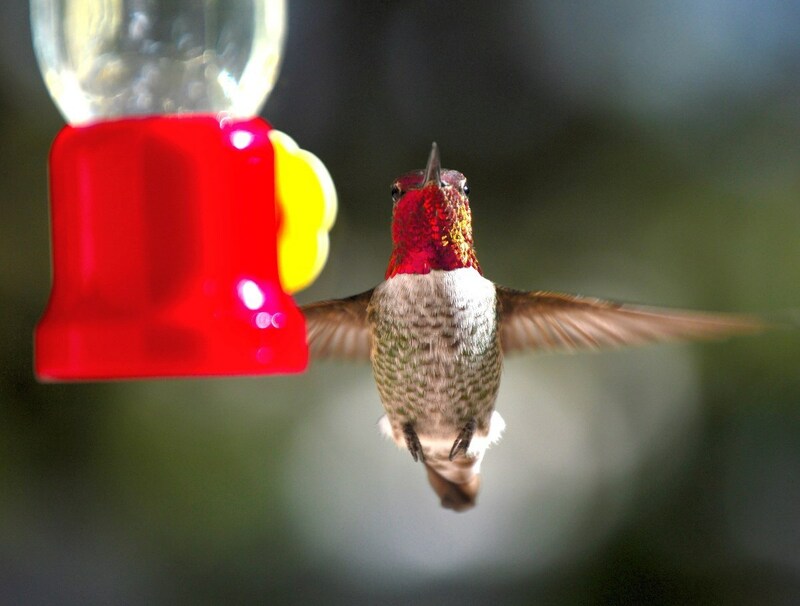 We see the Anna's hummingbird daily at this time of year. 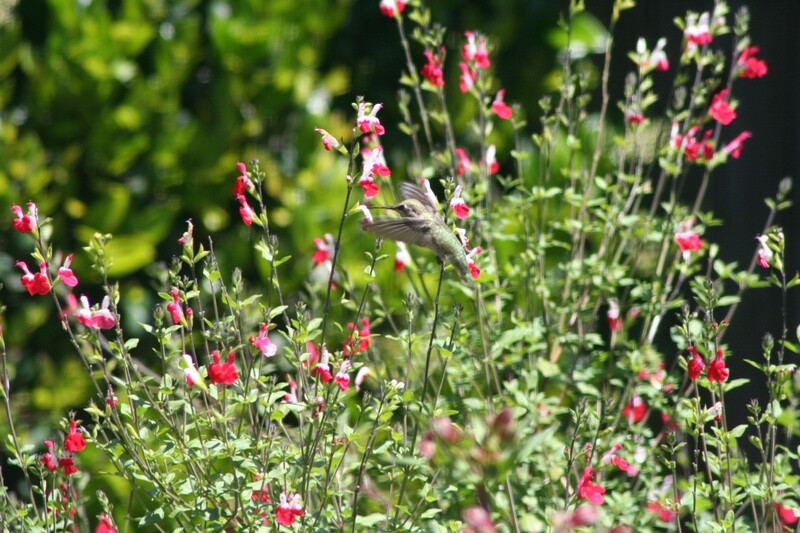 I had stepped out on the garden patio this morning and saw the hummingbird at the Hot Lips sage plant in our east garden. That is a new plant that we obtained this week. 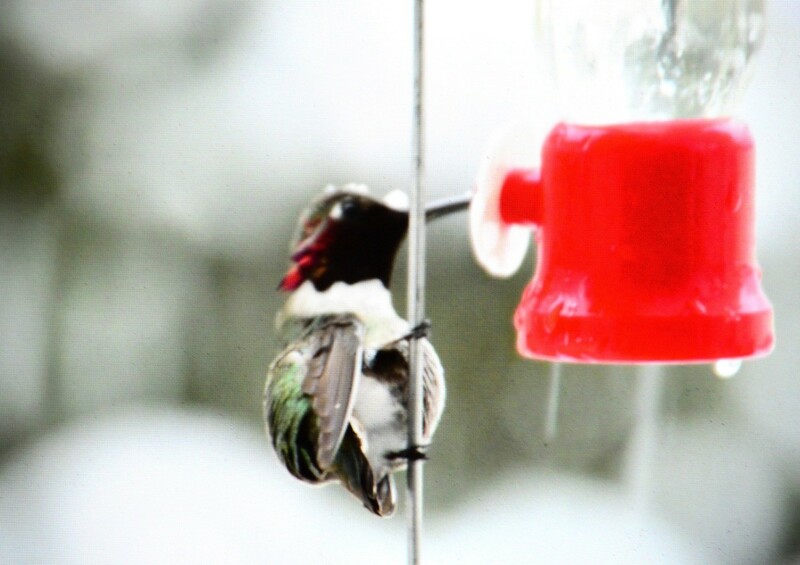 This Anna's hummingbird was approaching one of our feeders near the kitchen window. I used my telephoto lens from about 10 feet away, inside the house and through the window. 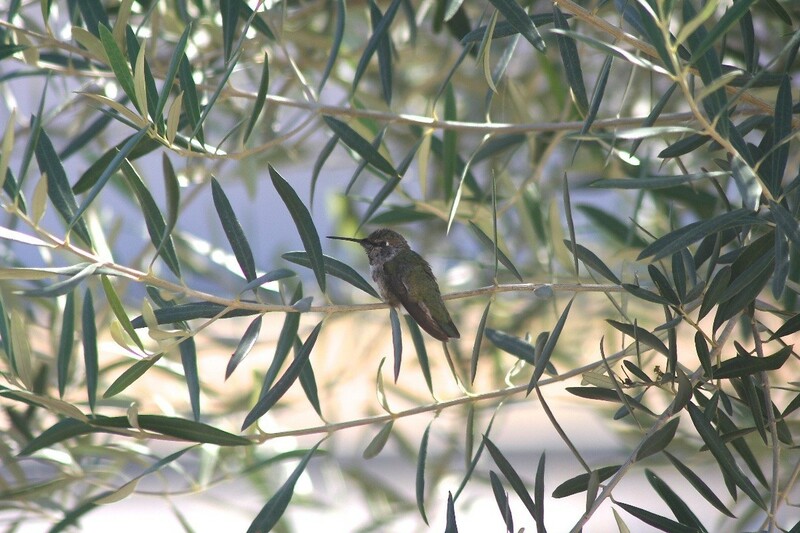 Our olive tree has become a "station" for Anna's hummingbirds in our garden to take a rest. 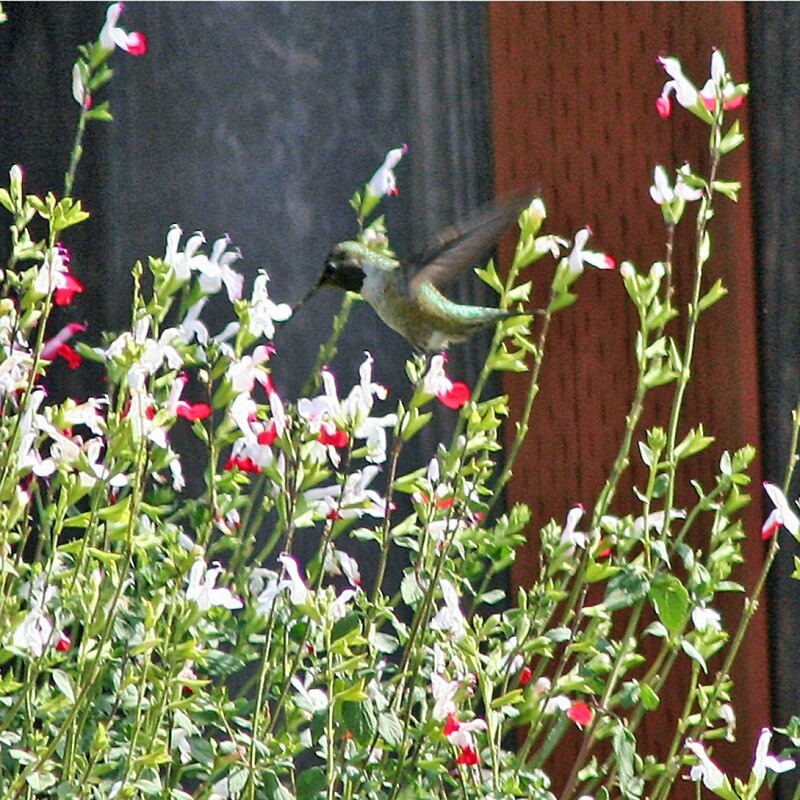 It is a shady environment and the hummingbirds daily use it for a short break in their action. They "buzz" around the garden with great vigor and during their feeding times, they visit most blooming plants for a meal. 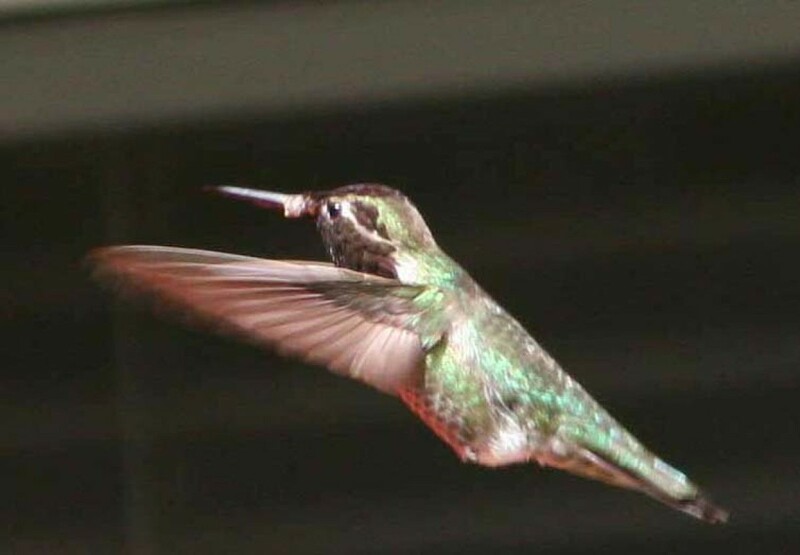 We have many hummingbirds coming into our small backyard "English" garden. We call it that as while in England we saw many small and very colorful and beautiful gardens and wanted to capture some of that beauty in our own garden. This lovely hummer let me get so close I could almost count his feathers. I named him-her? Stinker because of his antics and not being afraid of Kitty, just dive bombing her.